The MELT Method ® is a simple self-treatment technique that eliminates chronic pain, improves performance, and decreases the accumulated stress caused by the repetitive postures and movements of everyday living. MELT simulates the hands-on techniques that manual therapists Sue Hitzmann (creator of MELT) and Hilary Bilkis use, to eliminate stress, pain, and dysfunction in their private, hands-on body work clients. Through a series of easy, precise techniques — using simple, specialized equipment, like a soft foam roller and small balls — this groundbreaking program helps to restore natural balance back to the body. MELT works by treating the connective tissue, which surrounds every joint, muscle, nerve, bone, and organ. Connective tissue is the scaffolding that provides the support for your entire body. New scientific research has revealed that the missing link to pain-free living, is a balanced nervous system and healthy, well hydrated connective tissue. MELT rejuvenates tissue hydration and relieves the tension of day to day life that gets trapped in our bodies. MELT is easy to learn and is changing the way people care for their bodies. MELT also helps decrease accumulated stress in the nervous system, helping improve any person’s overall feelings of wellness. As a trained MELT instructor, I am offering classes or private sessions to teach you the MELT Hand & Foot treatment and MELT full body foam roller classes. MELT helps you to reconnect to your body, quiet your nervous system, and relieve chronic aches and pains. It will improve your flexibility, posture, range of motion and boost the results and effectiveness of your exercise routine. MELT improves your overall feelings of WELLNESS. For more information on MELT, and to find out about classes and special events, locally and around the country visit www.meltmethod.com. Watch how a fitness model and professional dancer finds relief from her chronic pain with MELT . She says she is now working smarter not harder. Click here to watch the segment from Nightline. The same episode, but more edited down was featured on Good Morning America on March 12. NEW!!!! Watch this Fox News piece about Patricia Davis, a professional violinist who has performed on some of the most famous stages in the world, from Carnegie Hall to Lincoln Center. “I go out to play the violin for six to eight hours in a day and sometimes as many as three performances in a day,” However, the music was almost silenced when she tore her rotator cuff while swimming. “I wasn’t able to play the violin without feeling like my shoulder was going to give out,” she said. MELT has allowed her to play the violin again without pain! 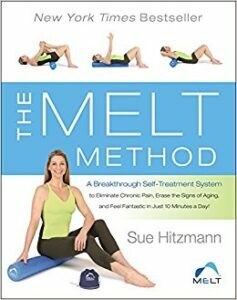 The MELT Method Book: A Breakthrough Self-Treatment System to Eliminate Chronic Pain, Erase the Signs of Aging, and Feel Fantastic in Just 10 Minutes a Day!, by Sue Hitzmann. On sale through Amazon.com. I will be offering MELT small group classes in my office. Class size will not exceed 4 participants. This will provide you with more individualized instruction. Materials provided for in class use. MELT tools available for sale. Special bundle pricing! Cash, Check or Credit Card Accepted. Wear comfortable clothing. Bring 32 oz of water with you. You must be able to get on and off the floor unassisted. MELT is changing the way people care for their bodies! Empower yourself to change how your body functions and moves!!! In this series, you will learn basic MELT moves, as well as more advanced techniques not featured in the MELT book. This workshop is IDEAL for people experienced with MELT, as well as for people who work out or play sports. MELT makes walking, running, dancing, hiking, yoga, Pilates, cycling, swimming – better! This class will only have 4 people to ensure that you receive lots of personal attention, so you truly feel confident enough with the techniques to use them on your own at home. I am also available for private MELT instruction. Private instruction offers you my undivided attention. You will learn the MELT techniques with lots of feedback and hands-on positioning. MELT Maps will be put together for your specific needs. My fee is $135 per hour. Bring a friend and split the cost.